I guess my New Year’s resolution could be to blog more, write fresh posts and become the next latest and greatest thing on the blogosphere, but that’s just not gonna happen. I am totally a blog when I feel like it kind of girl and lately I just haven’t felt it. I’m sure I’ll get in the mood sometime soon…but until then, I have a New Year’s Eve or Day Round Up, if you need some ideas. These little tartlets are filled with brie, a sauteed apple compote and a touch of honey. They are the world’s easiest and fastest eaten appetizer, and you can choose to make them with the slummin’ it Crescent Roll dough or fancy it up a bit with pie crust (frozen or homemade)…either way, it is a guaranteed HIT! Categories: Appetizers, Cakes | Tags: apple and brie tartlets, balsamic cherry sauce, brie appetizer, cheddar biscuits, chocolate pistachio cake, chocolate souffle cake with cherry sauce, cointreau chocolate cake, Devil's Food bundt cake, New Year's Eve appetizers, New Year's Eve desserts | Permalink. You WILL love me for this post. I guarantee it. But, will you also hate me? That I am not sure but I certainly hope not. 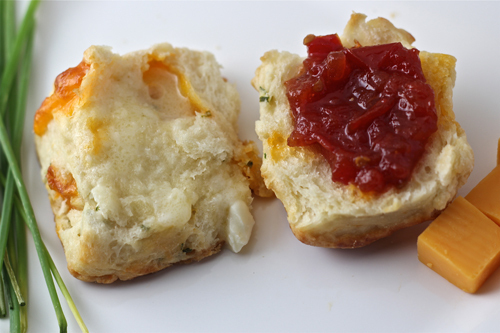 The problem is that this tomato jam and these cheddar biscuits are glorious and once you make them, you may crave them every day for a very long time. Categories: Appetizers, Bread | Tags: biscuits and jam, cheddar biscuits, cheddar chive biscuits, Solace Encinitas, Solace tomato jam and biscuits, tomato jam | Permalink.